Looking at your new pic, and since you say modern era, I would say 2. Your beams aren't tall enough for one. The prototype would strongly like to avoid the one between the tracks as that is likely railroad owned ROW that close to the switch. I think one as close to the bank as you can get but still have it full height, and then one at the edge where you show it. If you want to match the prototype, add an abutment for the non-floating end. Be advised the engineer would try to optimize by making all the spans (from abutment to pier and from pier to pier) the same length. Not sure what the max span would be for beams with that chord but I'm sure that data is available somewhere. Btw the bridge appears to be prestressed concrete, not steel beams. Pre-stressed became common by the early sixties. Abutment for sure, and possibly a large concrete apron below it, or at least rip-rap size rocks. But I'll challenge making all the spans the same length. 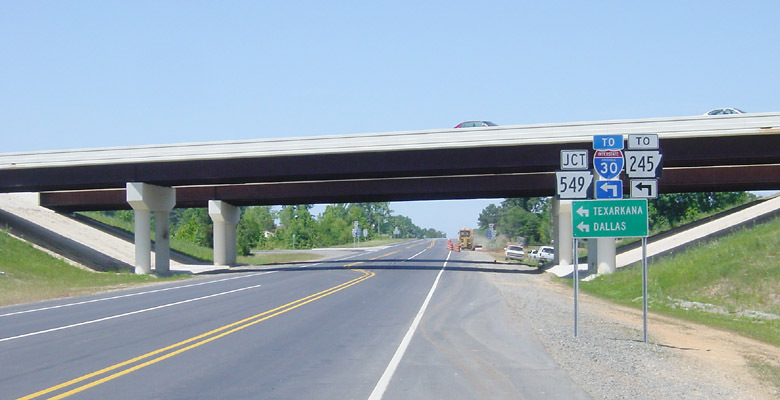 This is a picture of a fairly ordinary Interstate overpass. Note that the abutment to the pier is smaller than the peer to peer. That's pretty common due to the layout of the thing the bridge has to cross. This is the model I'm thinking of for the bridge in this thread...just with the left abutment missing as it goes off the edge of the layout. For your spans go with a ratio of 20 span to 1 chord depth. Even though it's prototypical, it still looks strange... to me, at least. My opinion would be either one in the center, which looks "balanced" and I think that's what Jan went for, or one like you show it towards the edge (where you need it for modeling reasons, as far as I understand?) which makes the bridge look longer, because my eye also expects that one to be in the center of the bridge. Yep, no optimization possible since you don't want to put a pier in the middle of a highway; expensive high chord beams are required for the long span. I’m with most and like #3 but as I have been told many times here as I began this journey, size and whether it’s prototypical doesn’t always matter but rather what looks good to you! In the end it’s your empire to do with as you wish. Of course RULE #1 always applies - that's a given. I enjoy including prototypical concepts in my layout, so it's sometimes a challenge. It's been great discussion on this so far. I originally started off thinking "three", but the logic presented in posts above has me leaning towards two piers now. Keep it coming! I agree with you, I think two piers looks better and fits the scene better, prototypical or not, it's all about appearances to me. You can't go wrong wither way, but I would do the 2 pier option if it was on my layout. Mainly for two reasons: The middle pier may block scenery if you are wanting to make this a focal point on the layout. The second is that it will be more difficult to clean the rails with that middle pier in the way. I am not sure if you were planning on making the bridge removable or permanent. If removable, please disregard my second reason and refer to my first reason. he second is that it will be more difficult to clean the rails with that middle pier in the way. I was thinking about maintenance too, which scores nicely on the 2-pier option. I am not sure if you were planning on making the bridge removable or permanent. I've also been debating this. The other reason to make it removable is to protect against accidental bumps, especially on the floating end. There's a turnout just beyond view on the right track, so derails could happen in either direction. Hands and Elbows will be in the vicinity. The option with 2 piers looks correct for a modern structure, say 1980's or newer. There was mention of span to depth ratio of 20:1 by NtheBasement and that is a good rule of thumb. You also typically want your approach spans to be on the order of 60% of the interior span lengths. This helps balance the bending moments in a continuous structure. The other thing you need to think about is pier protection. Railroads hate having infrastructure that is not their's on their property. If the edge of pier is within 25-ft of CL of track, then you need a crash wall. If the edge of pier is within 25-ft of CL of track, then you need a crash wall. Last thing I read before weighing in with my suggestion... which is that I favor 2 piers, but just push the piers in slightly tighter to the tracks each side! In other words, crash into that 25' mark, I guess. The big sloped abutment at the one end is a factor, I kinda think that needs to be modeled and included in the deliberations. I think the character of that abutment plus the broad span will help to establish your layout's modern era. For the floating part - which will get hit by elbows - perhaps you could screw on a plexiglass spacer to the fascia - large enough to protect it? It need not attach to the bridge end - just a protective measure? Definitely something to consider - some form of protection is needed. I was also thinking of securing the bridge to the pylons through the use of magnets or similar, so that any bump will just knock it from the pillars. This will require a seam in the road at the abutment, but that's an acceptable trade off. This will require a seam in the road at the abutment, but that's an acceptable trade off. OK, I'll admit it, I suffer from ADOSS. How the heck do you decide? N vs HO dilemma - Can't Decide!